We happened to be in Mexico for the Super Bowl this year. We watched the game in our room because we didn’t feel like fighting crowds at bars for hours. Also, the view from our room was pretty spectacular and we wanted to enjoy it. The downside of this plan is that the game is shown with Mexican commercials, and let’s be honest, I usually watch for the commercials. So that was a bit of a bummer. Thank goodness for YouTube! Of course we still wanted to have the requisite Super Bowl appetizers for the game, but with a Mexican flair. My dad had just been fishing so I made ceviche with his fresh fish as well as pico de gallo and guacamole. I think my favorite appetizer of the night was Jicama with Chile Lime Salt. It is healthy, refreshing, and just three ingredients. My parents had a version of this before I arrived at The Hacienda, a gorgeous restaurant in Cabo. I loved the idea so much I made my own version. You just need three things: jicama, limes, and chile lime salt. Chile lime salt is one my favorite spices. It is the “secret” ingredient in my favorite Chicken Vegetable Barley Soup. I think jicama is an underappreciated vegetable. It is crisp, kind of like a cross between a cucumber and a pear, and just slightly sweet. A cup of this root vegetable is under 50 calories, has no fat, and 6 grams of fiber! Don’t let the gnarly outside scare you. There is no better serving piece for this recipe than a margarita glass. I was able to borrow one from the hotel with a little sweet talking to our friend Jorge. I coated the inside of the glass with a layer of fresh lime juice and then sprinkled a generous serving of the chile lime salt. 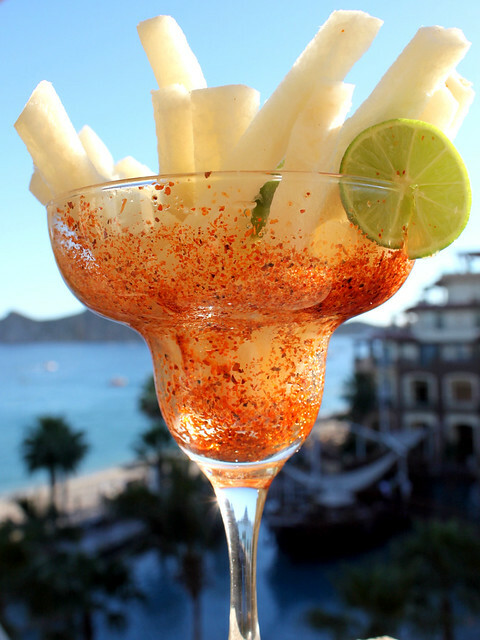 The jicama sticks are piled inside and then topped with another squeeze of fresh lime juice. This will definitely be going into my normal rotation. I hope you all have a wonderful Valentine’s Day with your sweethearts! 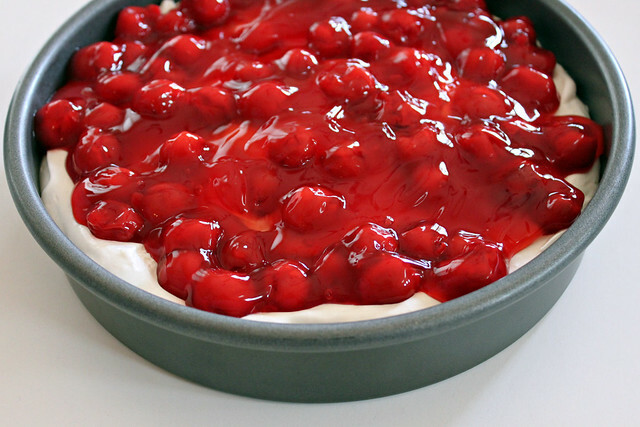 If you are looking for a quick dessert for tonight’s dinner check out this simple Cherry Cheesecake I posted for Valentine’s Day last year. I am fortunate enough to have dinner made for me this year. Lucky me! Peel the jicama and cut into half inch pieces. Squeeze one lime into a margarita glass and swirl around until the juice coats the glass. Pour the extra juice over the jicama sticks. Coat the inside of the glass with chile lime salt. Pile up the jicama in the glass and top off with more lime juice.